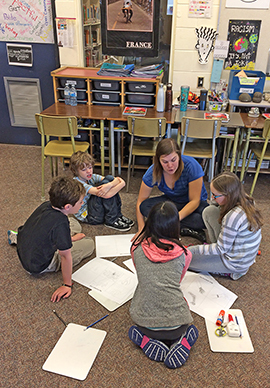 Teacher candidate Brenna Ellis with her practicum students at Giant’s Head Elementary in Summerland, BC. BRENNA ELLIS DIDN’T MUCH LIKE SCHOOL until she decided to become a teacher. Ellis lived in Natendorf, a small municipality in northern Germany, a 45-minute train ride to Hamburg. While in Germany, Brenna looked after three young children who educated her in thinking about school in a different way. Teacher candidate Brenna Ellis’s class during her practicum at Giant’s Head Elementary in Summerland, BC. It was this new approach to learning that prompted Ellis to give post-secondary education in Canada another try and apply for the Bachelor of Education (BEd) program at UBC Okanagan’s campus in Kelowna, BC. Now in the final year of the BEd program, and having just finished her practicum—teaching in her old elementary school, Giant’s Head Elementary in Summerland BC, Ellis learned that by letting students control the learning, you never know what each day will bring. Instead of delivering the school experience she had disliked so much as a learner—with desks lined up in rows, students listening to the teacher lecture at the front of the class for hours—she created an environment where students became explorers charting an unknown course to the yet-to-be discovered Canada. Every action the young explorers made had a consequence, a nod to the Choose Your Own Adventure series of children’s gamebooks. The activity was intended to teach the students about Canada’s unique history, from the perspective of early explorers and the First Nations peoples. Students in Ellis’s class also played the role of engineers when they were challenged with designing a prosthetic limb for an Olympic athlete that would enable, but not enhance, performance. Ellis was inspired to create the teaching opportunity by a Maker Day she participated in while in the BEd program. The Maker Day approach fosters teaching activities that operate on the premise that individuals can learn with an open process that supports tinkering, design thinking and purposeful play. Maker Day students (of all ages) are given a real-world challenge to solve through their own designs. Students then use their designs to create a prototype of the solution using supplies in a Group Kit —pipe cleaners, cardboard, pompoms, and almost anything else you might find at a craft store. 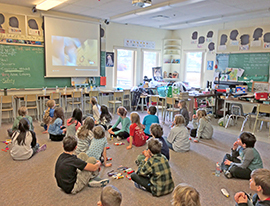 When Ellis brought the idea of creating a Maker Day to the Grade 4/5 team at her practicum school, Giant’s Head Elementary—in fact, the school she attended when she was a child—the other teachers were nervous but supportive of the young teacher trying to introduce new approaches to learning in the classroom. The students in Ellis’s practicum class didn’t know what was happening when they entered the classroom—they found desks pushed to the sides, and giant piles of cardboard stacked around the room. Susan Crichton, Director of the Innovative Learning Centre, which hosts Maker Days, was not surprised that the student had a successful experience. “Everyone and anyone who fully participates in Maker Days will experience success because it is the learning centres in the process more than the product. Risk taking and experimentation are not only encouraged but required!” says Crichton. With only a few months to go before 2017 graduation, Ellis is thinking next steps, which include international travel. She’s moving to Australia on a travel Visa with aspirations of teaching and learning within the Australian system. Although Australia is the next step, teaching and learning in BC is her end goal. Born and raised in Summerland, BC, Ellis hopes to go back to her childhood home and learn amongst the teachers that inspired her while she was in school. She credits the amount of practical experience she had while in UBC Okanagan’s Bachelor of Education program for her desire to think outside the box when it comes to teaching and learning. “My ‘Mentor Teachers’ gave me the freedom to try absolutely anything,” she says. “We need to evolve our teaching practice to match the tone of society, because students don’t learn what I learned, or how I learned, while I was in school.